In my shamanic practice, I work with people from all over the world. The first decade of working with others, easily three quarters of my clientele was international. That distant acceptance seemed to indicate that other cultures had a more accessible understanding of shamanism and of what someone acting in the role of shaman does. In more recent years the shift toward a wider range of healing paths becoming more mainstream has coincided with my client base being mostly within the U.S., with a good third of those people residing in my local area. For those who don’t know, I’m a native North Carolinian and acting interfaith clergy. While there is strong support for and a very networked Pagan community throughout the state, half of my clients do not identify as Pagan. Specifically, they identify as various denominations of Christian. For some, stepping into a more mystical expression of spirituality is a comfortable and natural extension of their faith. Others don’t allow such an esoteric openness in their belief systems. Rather, they reach out to me because other venues haven’t brought them balance, including pastoral counsel with their own clergy. Regardless of how they’re ushered into my work, it is within local circles that I encounter the most powerful misconceptions about shamanism. 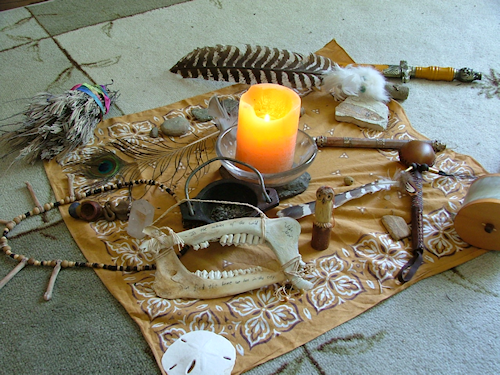 In talking with clients about how they find me, a startling idea emerged: For many of these clients the idea that I’m Pagan is softened by knowing that I’m a shaman, as if that role somehow makes the truth of my spiritual path somehow more approachable. Upon delving further into that assumption a deeper misconception was revealed: the assumption that I’m Native American. That I have a fine thread of indigenous blood runs entirely independent of my calling and choice to be a shaman. A handful of people besides myself would even know that fact, just as they don’t know that I’m Scottish, German or Irish. They don’t know, because it’s not relevant. The replete misappropriation of all things shamanic to Native Americans, indicating a lack in base understanding of shamanism. Both of these beliefs open a wide arena of cultural land mines, the least of which is cultural appropriation — the claiming of a facet of another culture as one’s own, historically for exploitation, personal profit or gain. Even though I do not claim the spiritual heritage of another culture, a good proportion of my clients assumed that I did, by virtue of projecting their ideals onto my heritage. That’s one problem. The other is that because they assumed my lineage, they rested comfortably in misunderstandings about my path. The message is that by assuming I’m Native American, my devotion to Earth religions is more OK than knowing I’m a modern Druid, Reconstructionist, Pagan. Do most people not realize that in the animistic “country dweller” definition of Paganism, Native Americans are Pagan, under a diverse umbrella of spiritual traditions? Is there an instant, if not unconscious, distinction made between Pagans who are of European lineage and those who are Native American? And if so, does that not imply a judgement from many in the mainstream soul healing community that certain kinds of Pagans are better? In the long run does it matter if the people who come to me for help know this distinction? Does it affect our work if they don’t know that shamanism is the tap root of all religions, branching through every culture? Probably not. All they know is something isn’t well in their lives and nothing else has brought relief. For me it’s a question of how much integrity my path has if I leave clients making assumptions about my lineage and work that aren’t true. In my studies, personal spiritual discipline and work with others, I don’t feed the racist dispersions the western route into shamanism has cast; thus, I don’t want to mislead anyone about my ethical intentions. For that reason I do take the time to educate clients who don’t understand how we arrived at shamanism in this age, and how I became able to carry a spiritual tradition forward in a new way that fulfills the needs of modern seekers while honoring an ancient tradition. In the end, Pagan is just Pagan.